The first experiments with Japanning onto tin plate happened in Pontypool South Wales. The town of Pontypool was founded on the iron industry and it was also the first place to introduce a rolling process to create tin plate. In the Pontypool tinplate works, experiments were conducted with various methods of finishing the metal which resulted in the production of Japanned tinplate goods. Before the end of the 17th Century, iron makers had found it very difficult to make thin iron sheets. It could only be made by laboriously hammering out the metal by hand which produced sheets that were often uneven and thick. At his ironworks in Pontypool, John Hanbury developed a heavy rolling mill through which heated iron bars were rolled a number of times to produce a sheet that was smooth and thin. The sheets could then be made into a range of kitchenware including pots, kettles and saucepans. Hanbury also developed a cheap way of coating the iron sheets with a very thin layer of rust resistant tin. It was these two developments that led to a method of Japanning metal which was both hard wearing and beautiful. When John Hanbury took over the family business in 1685, he was the first of his family to move to Pontypool, which he did to directly manage the ironworks. He gathered around him a group of experienced ironworkers and his factory soon began to produce significant amounts of iron goods that were of a superior quality. One of his managers, a man called Thomas Allgood, often conducted experiments to try to improve the quality of the iron being made. It was during these experiments that he discovered a material which could be used to coat the metal and which, when heated, created a brilliant hard lacquer on the surface. Thomas Allgood never explored how his discovery could be used as he continued to manage the ironworks. Thomas Allgood died in 1716, and his son Edward took his place. It was Edward along with his brother John, who developed their father’s discovery. When Charles Hanbury took over the business in 1732, the first small-scale production of Japanware began in the UK. The Allgoods set up their business in a small cottage in Trosnant. 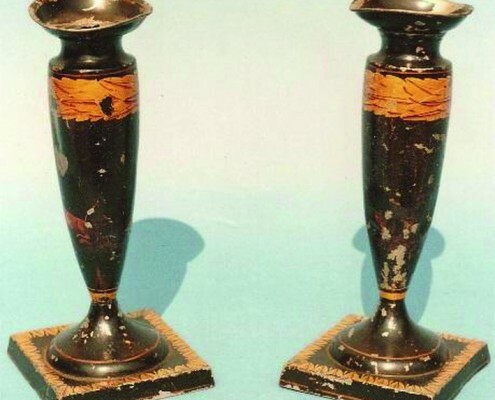 At first, the articles produced were small domestic articles such as candlesticks, tea trays, butter dishes and powder boxes. 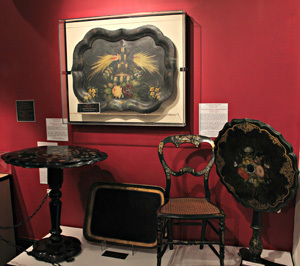 They were decorated in imitation tortoiseshell with Chinese landscapes, figures or floral designs. The business quickly began to expand. 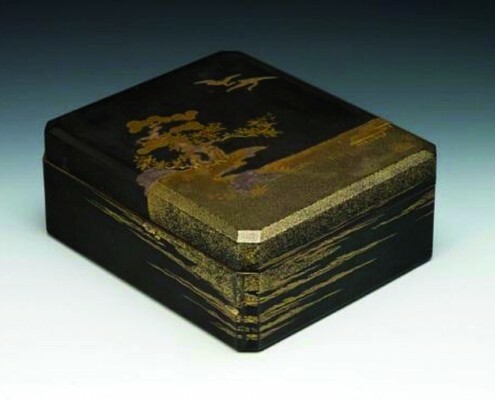 People began to order special items: personal snuff boxes or trays with particular portraits or landscapes: even pictures of their own homes and gardens. Japanware was very fashionable and so the items produced at the Pontypool works were very expensive. 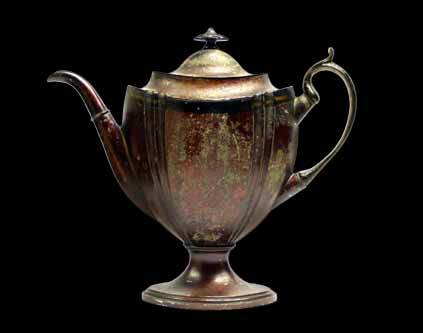 Pontypool Japanware became so highly prized that Charles Hanbury is said to have given Catherine the Great of Russia some pieces when he was Ambassador to her court between 1755 and 1757. Due to the growing demand for Pontypool Japanware, the business grew and prospered. It became popular all over the world, especially in America. Factories were set up in Usk and the Midlands, but the Japanware made at Pontypool was considered to be the best. The Allgood family continued to keep the original recipe for the coating a secret.